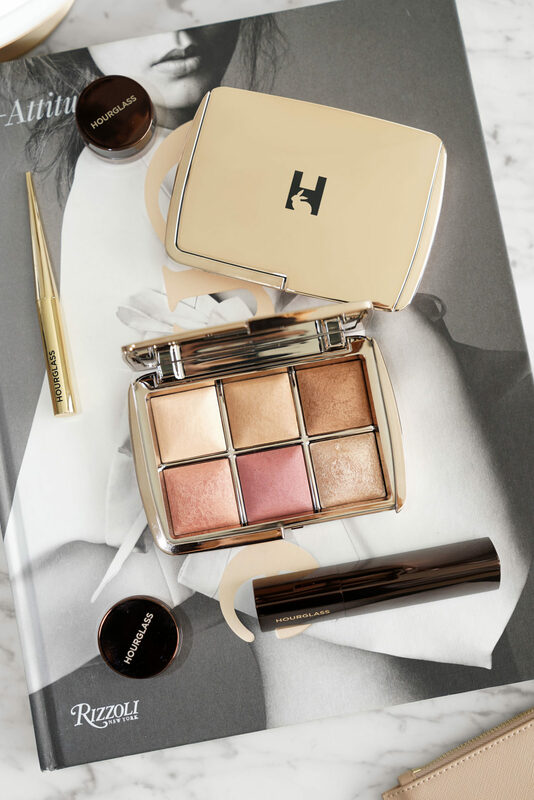 Reviewing some more Hourglass Cosmetic holiday launches today with swatches and thoughts on their limited-edition Ambient Lighting Edit Palette Volume 4 ($80 for 1.3 g x 6) + Confession Lipstick Duo ($34 for 2 lipsticks). Everything is limited-edition and comes in metallic lavender pink packaging. 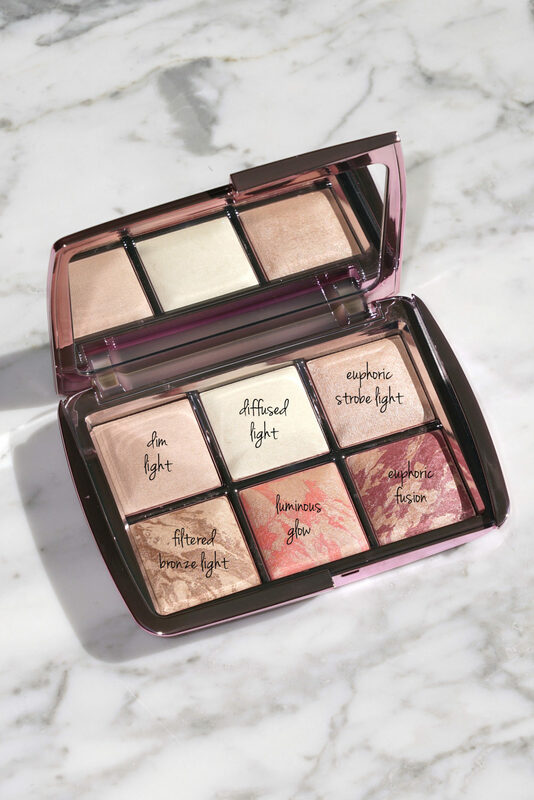 I already reviewed the Ambient Lighting Edit Palette Unlocked Edition earlier in the month but received so many requests to compare it to the Volume 4 Palette. The two have a similar luminous feel, Unlocked has all new shades while Volume 4 has mostly repeats. The shades are easy to wear and have a range of setting powder, highlight, bronzer and blush. The palette performs really well. Part of me wishes it had all new shades. Even the new ones have a similar vibe to existing colors. I do really love this one, I think I prefer it to Unlocked. I find it works better for my skintone and has more of what I’m looking for in an entire look. Unlocked is still very pretty, it just runs darker on my skin. Everything has smooth application. The texture is the same quality as individual products. Skin is left luminous and glowing. Shimmers don’t emphasize pores. Lasting power is excellent. There are a few lip set options this holiday, I ordered the Confession Lipstick Duo with My One Desire and At Night. I neglected to check my stash and didn’t realize I already had these from previous launches until I swatched them. These come with one case (the pink tube) and the black case is the refill. You can definitely use the lipstick without the metallic case. My One Desire is a neutral cool mauve pink, At Night is a deep brick red. Both perform true to the Confession Lipstick formula – ultra creamy, opaque, smooth and long lasting. I still think these are among the most overpriced lipsticks on the market, but the quality, color selection and finish are truly excellent. A look at the Hourglass Confession Lipstick Duo My One Desire and At Night vs original Gold Packaging. All the existing Confession Ultra Slim Lipsticks swatched here. Beauty look below with new hair! Also wearing Armani Luminous Silk Foundation in 6.5 + 7 mixed. Ambient Lighting Edit Palette Volume 4 Dim Light + Diffused applied all over as a setting powder, a mix of Filtered Bronze Light and Euphoric Fusion on the cheeks, Euphoric Strobe Light on the eyes. My One Desire worn on the lips. Quality-wise everything is excellent. I’m really happy with the palette even though I have repeats. I always find them convenient for on-the-go or travel. All this said if you already own some Hourglass powders or palettes I’d recommend that you shop your stash. If you’ve never splurged on an Hourglass Ambient Lighting powder the palettes are a great way to dive into the line. Quality is great and even though the price of palettes is steep it’s a nice way to try multiple colors and finishes rather than buying individual colors which add up to more. Yes, value-wise price per ounce or gram the palettes are not the smartest buy. I also feel this way about the lipsticks but have mentioned numerous times the quality is excellent. Have you checked out any of the Hourglass holiday launches this year yet? What did you think? 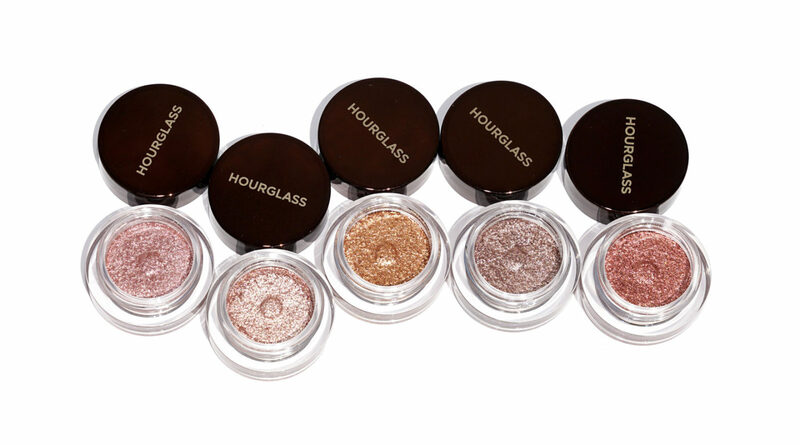 Hourglass Cosmetics launched a new eyeshadow called Scattered Light Glitter Eyeshadow ($29 each for .12 oz/3.5 g, made in Korea). I bought all five shades while at Sephora for the Beauty Insider event and every color is amazing. These are pressed pigments with micro-glitter that give the eyes a beautiful glimmer. The word “glitter” had me a little worried which is why I didn’t order them online sight unseen. I love a good sparkle but sometimes glitter can be too much for what I’m comfortable wearing. These aren’t too glittery for me although they are sparkly. You can wear these alone, layered over shadow, layered together or if you apply with a damp brush it will give you a more foiled look. Lasting power is excellent. I’ve only given these a 2 day test since I just bought these but they stayed put for hours without fall out or budging. On Friday night I’m embarrassed to admit I fell asleep with my makeup on. It’s something I tell myself to never do, but it was one of those exhausting weeks. The eyeshadow was still in tact the next morning. There are five shades, two are more glitzy than the others (Foil and Blaze). Shimmer-wise they are indeed shimmery but the glitter is super fine and not chunky. Even on the eyes they have a smooth finish. I like apply with the fingers. They’re easy to smooth and blend out. On me Foil and Blaze are the most sparkly. I don’t think I can wear them alone everyday, although layered over a powder shadow tones down the sparkle a little. Also if I layer the gold on top of the copper it creates one of the prettiest multi-dimensional looks. Some swatch comparisons to Armani Eyes to Kill Eyeshadows (now discontinued) in 8, 9 and 5. Also swatched next to the Natasha Denona Crystal Top Coats. The Armani Eyes to Kill had a more metallic finish with less glitter. Natasha Denona’s have more glitter and a sheerer base color. MAC Dazzleshadow Liquid is more like a metallic finish (review soon on these). Bottom line I love them all. 100% worth the splurge. If I had to narrow down my picks I would pick Reflect and Smoke. They are on the sparkly side but they wear beautifully in a variety of ways. I like that they are easy to apply and that they don’t have fall out on me. I think all the colors are standouts although Foil is a very yellow gold and I usually don’t like gold colors like this but it is pretty when layered with other shades. 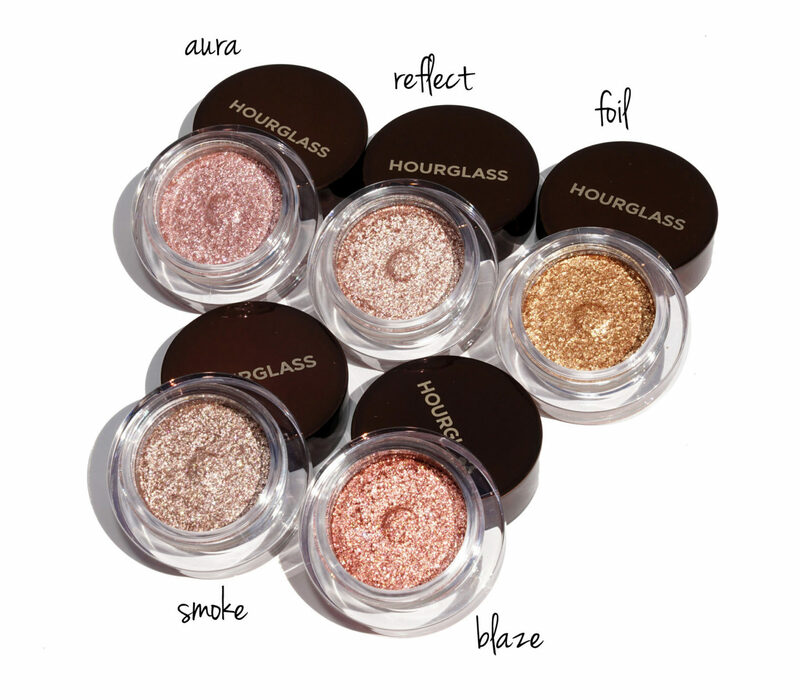 You can find the Hourglass Scattered Light Glitter Eyeshadows out now. You may have to shop around as they have sold out on a few sites. Available at Sephora, Beautylish, Nordstrom, Neiman Marcus, Barneys New York, Space NK and Hourglass Cosmetics. Did you try these yet? I think they’re phenomenal! 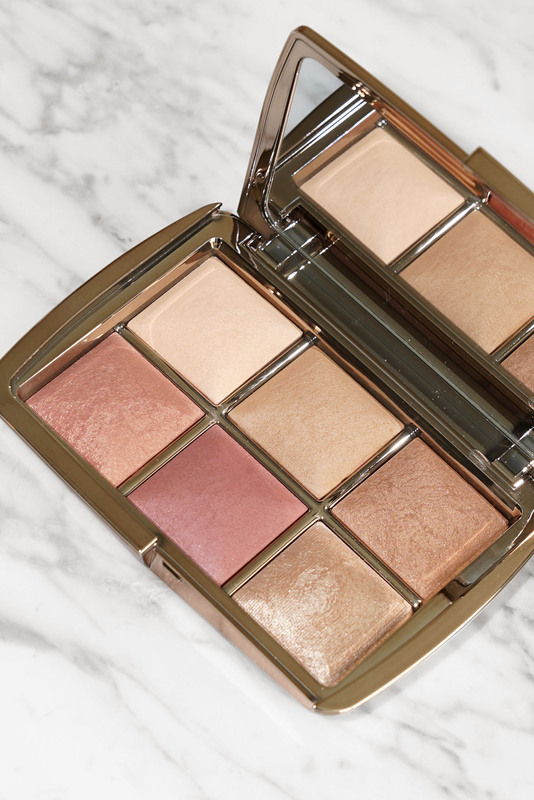 Up first is a look at the Nordstrom Anniversary Sale Ambient Lighting Blush Palette. 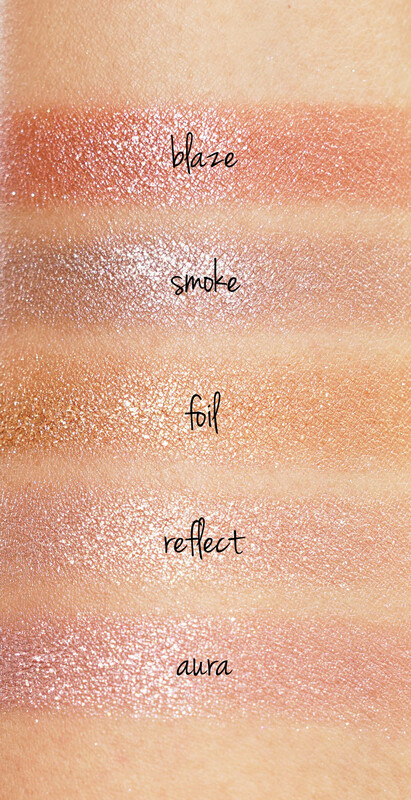 This has one new shade Surreal Glow and two repeats in Luminous Flush and Mood Exposure. Surreal Glow is the new color which is a soft light peachy pink glow which was actually in the Hourglass Holiday 2016 Surreal Light Palette. Each powder is hand made so no two are identical and colors can be the slightest bit different depending on how much color you get in each swirl. The Surreal Glow in my Nordstrom Palette is slightly deeper than the one I have in the Surreal Light Palette. If you’re an Hourglass fan there’s a high chance you already own 2 of the blush colors. I wish they would launch palettes with all new shades, but I do like these for their convenience, especially for travel. Swatch comparisons below to a few colors from two previous Hourglass palettes in Holiday 2017 Ambient Lighting Edit Volume 3 and Surreal Light Holiday 2016. I also found one close dupe with is the MAC Mineralized Skinfinish in Nuanced (reviewed here). The difference being Nuanced is a lot more shimmery and frosty so it’s more dramatic and won’t quite give you the same effect. Color-wise it’s the closest one I have. Next are the Veil Product additions including the Veil Translucent Setting Powder, Veil Powder Brush and Veil Retouching Fluid in Natural. Their Veil Mineral Primer has been a long-time best seller for them. It’s an oil-free version so best used with oil-free foundations. Earlier in the spring they launched a few additions. The Veil Translucent Setting Powder is an excellent translucent setting powder that doesn’t add any white cast to the skin and sets the face in a very natural way. On me it keeps makeup staying set all day without any cakey look. Texture is ultra fine and it does have a very subtle blurring effect to smooth out pores. It’s talc-free, invisible on the skin and has no flash back. The Veil Powder Brush is a double-ended brush that is loose and fluffy. I really love the way it feels on the skin and it performs really well. I use the larger side for loose or pressed setting powders and the smaller one is perfect for their blushes. It’s not quite as matte as the Marc Jacobs Coconut Setting Powder. The Hourglass one also has a lighter weight feel compared to Laura Mercier’s Translucent Setting Powder. All three are excellent, I cannot pick a favorite but I’m really pleased with the way the new Veil Translucent Setting Powder has performed. The Veil Retouching Fluid is the best thing I’ve tried to highlight and enhance complexion. It has just the right amount of pigment and sheerness to apply under eyes, between brows upwards and anywhere you want to brighten the skin. Most of us use concealer to highlight and brighten. A good blending technique with a damp beautyblender will do the trick to smooth everything out, but in my opinion I think most of the concealers are too opaque to apply on wide areas of the face. I still do it occasionally when my foundation doesn’t have enough coverage, but in the Florida heat layers on layers of makeup are prone to caking eventually. For this formula the color Natural is my best match. It cancels out redness but in a natural way. It doesn’t cake or crease. It’s easy to touch up mid-day on top of your makeup and blend. I swatched all the colors in store, sorry for the poor lighting quality but I took this in the mall with my iPhone, but I hope this helps as a reference for the color range. I feel like the gaps in between each color are fairly decent. The pigment is sheer and quite forgiving so I think you can easily find a match. Last but not least is their new Caution Extreme Lash Mascara. I think it’s very good but it’s not my favorite as I cannot get it to consistently hold the curl. What it does do is give volume, intense color, and dramatic lashes. It stays on all day with zero smudging in my experience. It has lasted on multiple tests through Florida humidity, a swim in the ocean and an afternoon at the beach. It really looks amazing when it works! The holding the curl issue isn’t always working for me but so many mascaras don’t hold the curl for me. My solution is to sometimes layer different formulas for added volume and lasting power. A lot of you have messaged me saying you use this trick all the time! Right now my top two favorites are still the L’oreal Lash Paradise Waterproof and Tom Ford Waterproof Extreme. If I layer this new Hourglass mascara with the L’Oreal it works like a charm 100%. Overall some nice additions and a few things to consider as beauty staples. 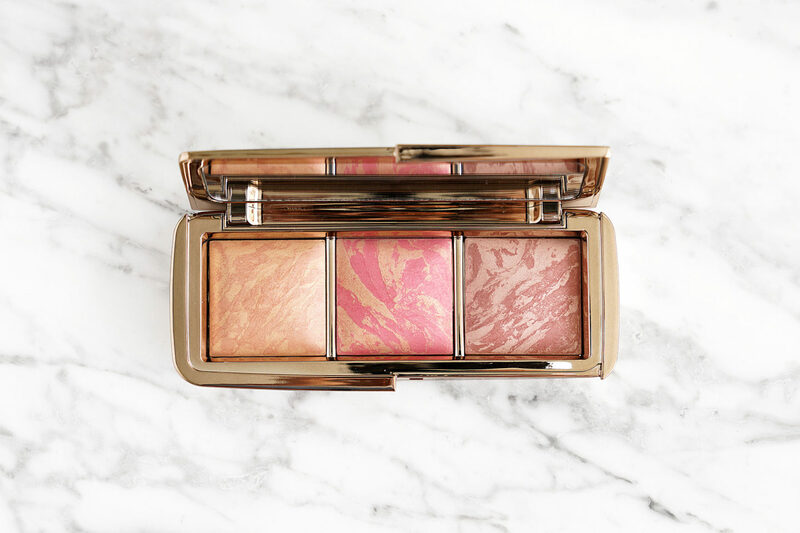 The Hourglass Ambient Lighting Blush Palette is a Nordstrom exclusive, but all other items can also be found at Sephora, Beautylish, and Hourglass Cosmetics. If you’re looking for minis to try Sephora has a few options with a Mini Caution Extreme Lash Mascara and a Veil Prime and Set Mini Duo available. Have you tried these yet? What did you think? Veil Translucent Setting Powder, Retouching Fluid, Veil Brush and Caution Mascara provided for review. Up first is the Ambient Lighting Edit Volume 3 which has a mix of existing and new shades. The colors included: Diffused Light (soft pale yellow satin powder), Hypnotic Strobe Light (pale champagne shimmer), Dim Light (soft pink satiny powder), Luminous Bronze Light (light bronze), Surreal Halo (mauve rose shimmer), Pure Effect Blush (light but bright pink). The entire feel and vibe of this is on the light to medium side for color. Pigment is soft to medium with a naturally glowy feel. I thought the colors would be too light for my tan complexion but they all show up on my skin – Diffused Light and Dim Light of course have a sheer effect, almost like a finishing or softening powder. The bronzer does seem quite a bit lighter in color than the individual ones I own. Each powder is unique so I do understand there could be variation because the one I have in the palette has more highlighter vs bronzer, still the effect is noticeably lighter. Finish is smooth and doesn’t emphasize pores. Lasting power is quite good – it stayed put on my face and cheeks from morning to late evening. All this being said if you already own a lot of Hourglass products individually you may find there are very close dupes. As mentioned in a few recent posts I’m in between places and most of my items are in storage so I don’t have access to products for comparisons. Off the top of my head I do feel this palette is very similar to existing shades although the Pure Effect Blush is one of the prettiest pinks I’ve ever swatched. 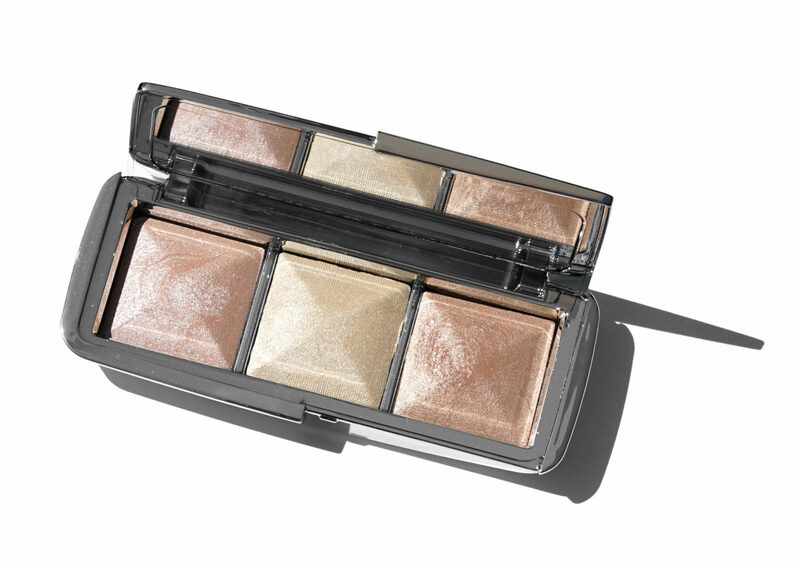 Up next is the Metallic Strobe Lighting Palette which I’ve previously reviewed here. The powders are smooth with buildable pigment and rich shimmer. It’s wearable for a pretty highlight but a little on the pale side for my tan complexion right now. Full review + swatches (also shown on the face) here but I’ll repost images below. Last but not least is the Hourglass Ultra Slim Confession Refillable Lipstick Set. It has three new shades of lipstick that are exclusive to the set. There is one gold bullet exterior and two refills inside. 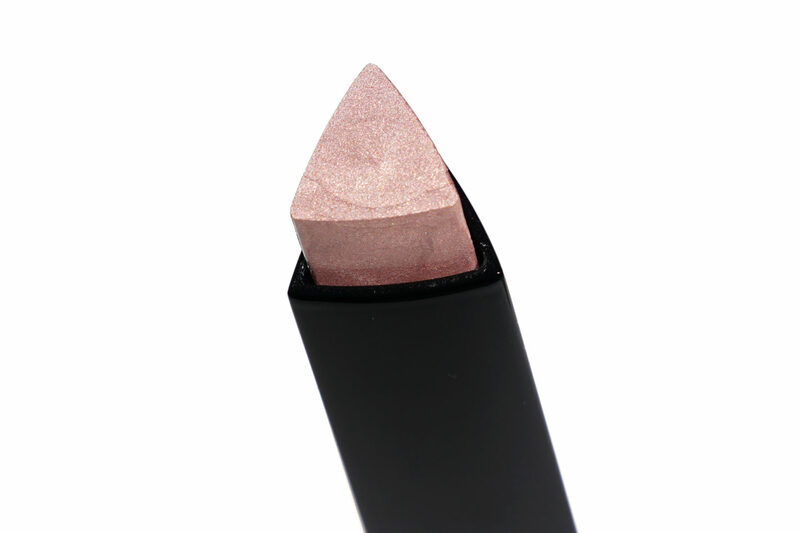 The pigment is opaque with full coverage and smooth. Formula is just as good as the individual shades all reviewed and swatched here. You can find the new Hourglass launches at all Hourglass counters, stores and retailers now. They are limited-edition. Available online at Nordstrom, Sephora, Bergdorf Goodman, Space NK, Net-A-Porter, Barneys New York and Hourglass Cosmetics. New Hourglass launches sent courtesy of Hourglass for review. Giveaway items purchased by me. I’m back in Florida with my family and we are all safe and sound. We are all slowly getting back into the swing of things and today I have a review on the Hourglass Confession Ultra Slim High Intensity Lipsticks ($34 each 0.03 oz/ .9 g, $22 for the refills). I had planned to publish this weeks ago but as some say better late than never. I initially reviewed one shade called I Woke Up in my neutral lip haul back in July (time flies!). At that time there were only select handful of shades that launched in store but by now the Sephora stores I’ve visited have the entire color lineup. The Hourglass team sent all the refills for review and I’ve swatched them by color grouping below. Due to time restraints, life and travel I didn’t have time to photograph and edit all the lip swatches, but I did test each color. I find my initial thoughts to be the same across the board. The Confession Ultra Slim High Intensity Lipsticks are among the best formula I’ve tried. They’re creamy, opaque, smooth, incredibly long-lasting, they don’t feather, they don’t dry out the lips and there’s no detectable scent. The slim packaging has a good weight in the hand when you hold them – it’s actually a lot nicer in person than I had anticipated. The only downside is the price which I still think is too high considering the amount of product you get. After falling in love with I Woke Up, I had planned on purchasing 2-3 more colors as the formula is very very good. A press package arrived before I made it to the store. There are 30 shades total available at most stores and counters which I have swatched and reviewed today. 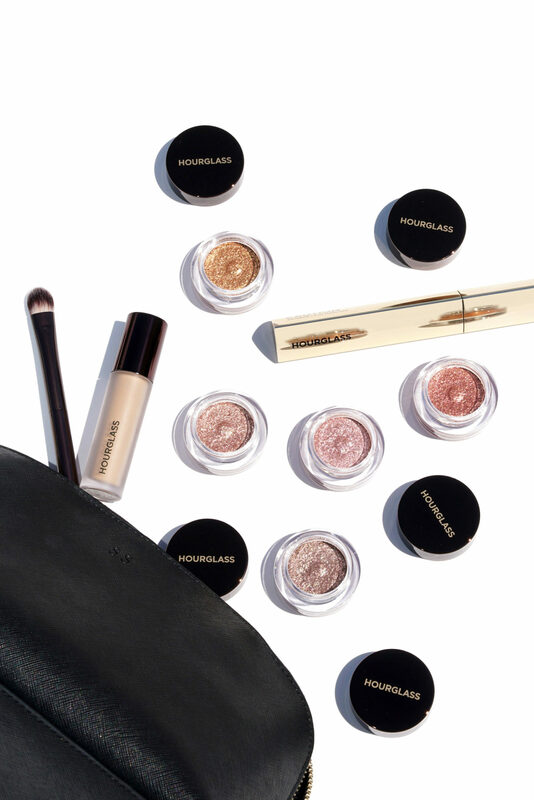 There are a few colors exclusive to the Hourglass website in I Dream and I Love, along with three shades exclusive to a Holiday Trio Set with My One Desire, True Love Means and You Are My. I don’t have these featured in this post but I will review the colors in the holiday set soon though. In swatching 30 of the colors on the arm and testing them on the lips I was really impressed that each color had smooth opaque coverage. In lipstick launches I usually find at least a few colors that are either too pale and streaky or too dark and streaky. All the colors I tested covered my pigmented lips entirely with ultra smooth pigment and coverage. There were a few pale colors I found a bit too pale for my skintone but they still performed really well. As usual a lot of the reds looked really similar on my complexion but that is the case with most reds. You can see a slight difference in undertone in the arm swatches so if you lean more towards a warm or cool base I hope the swatches help you find your perfect red. A quick look at the packaging. These are refillable lipsticks and they are easy to assemble. You can buy them as a complete lipstick for $34 or the refills at $22 each. The refills themselves are usable alone so if you want to skip the exterior you can. For the refills you basically remove the cap and base and insert them into the gold exterior. They twist up and down. I swatched 10 shades on the lips to try and show the range of color. These are all swatched on bare lips. Foundation shade worn is Tom Ford Waterproof Foundation and Concealer in Natural. As mentioned in my previous review these are excellent in formula, presentation, packaging and lasting power. They aren’t moisturizing but they don’t dry out my lips. These Confession lipsticks also feel comfortable and weightless on the lips even though they are full coverage. The slim design and angled mold these are formed in helps create a clean and precise line. By comparison the GIRL Lip Stylos have a creamier feel with more shine but also can get prone to looking messy once you wear the tip down (not a deal breaker for me, but just an observation). I love that the Confession lipsticks have a tiny bit of shine to them as I don’t find that matte finish lipsticks wear well on me (with the exception of the Louboutin and Charlotte Tilbury mattes). In terms of lipstick launches this formula is excellent with full smooth coverage. Out of the new launches I have tested so far, I have no regrets purchasing I Woke Up and would have had no regrets buying a few more although I still think the price tag is too steep for the amount of product you get. If you are looking for a high quality full coverage long-wear lipstick that doesn’t look cakey or matte this is a great option. You can find the Hourglass Confession Ultra Slim High Intensity Lipsticks along with the refills at all Hourglass counters now. Online at Nordstrom, Sephora, Space NK, Bergdorf Goodman, Barneys New York, Hourglass Cosmetics and all other Hourglass retailers. Have you tried any of these yet? What did you think? Confession Ultra Slim High Intensity Lipsticks gifted courtesy of Hourglass for review.